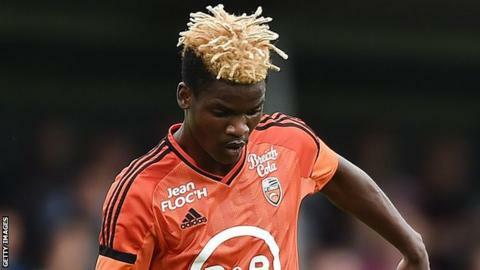 Sunderland have signed Gabon international midfielder Didier Ndong from Lorient for £13.6m. The 22-year-old has signed a five-year deal at the Stadium of Light after 18 months at the French club. The fee is the highest Sunderland have paid up front for a player. "I am excited to meet everyone at the club, to see the stadium and of course the fans, who I have heard so many good things about. Today is the most beautiful day of my life," he said. "Maybe the Sunderland fans don't know me yet, but I promise they will quickly discover that I will give everything for them and the club." The upfront fee surpasses the £13m Sunderland paid for Asamoah Gyan in 2010, but the deal that brought Steven Fletcher to the club in 2012 included add-ons potentially taking the cost to £14m. Sunderland later confirmed that a move for Boavista goalkeeper Mika was unable to be completed before the transfer deadline. Ndong started his career at Tunisian side CS Sfaxien, playing 40 games, before signing for Lorient in January 2015 and making 46 appearances for the Ligue 1 club. He has 18 caps for Gabon after making his debut in 2012.